The thing about people who whine a lot, is the whining is usually part of a denial mechanism. They spin their wheels over how miserable their situation is because they are unwilling or unable to step back and see the big picture, or who is behind all of this supposed suffering. 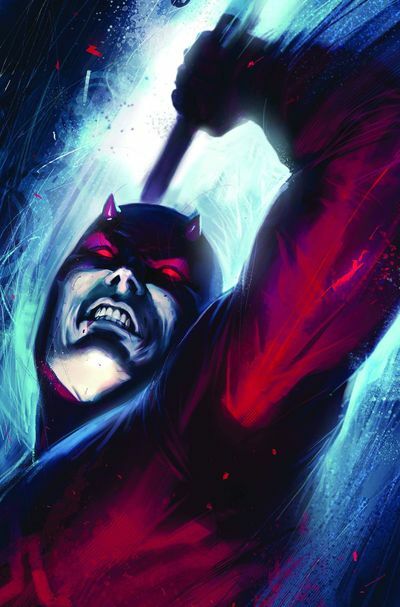 Daredevil has always been unable to see, but he has never been so unwilling as he is in Ed Brubaker's epic run on the series. As many times as it is shoved in his face, he simply refuses to see that he is the cause of his own tragedy. What worked: For starters, the cover. That's the good guy in this book? It is compelling enough as a stand alone image, but when you bring with it some knowledge of the kind of trouble that DD usually finds himself in, and the way that he tends to lash out when pushed and deal with consequences later. You know without reading a word that something really bad is going to happen. Inside the issue, we find all of the voices of reason in Matt's life telling him to put the breaks on. None of them have the full picture of the disaster that he is brewing, but they all know their friend well enough to know when he is messing up. And, of course, Matt would prefer to wallow in denial, self-pity, and mis-guided rage. This little down-ward spiral of his plays out wonderfully. We are inside his head enough so that we can see why he thinks these things will be good ideas, but we are outside enough to see why everyone is so frustrated with him. The unfolding "Return of the King" story is fantastic. The Kingpin has been toppled and returned several times. This could be the best of them. You can see the cunning brutality that made him the man he was, and may yet be again. What did not work: This issue sees the return of another classic DD villain, he just seems a bit out of place in this brutal new world. When The Kingpin is an evil wrecking-ball of a pawn being used as a weapon against both sides...it just raises the stakes quite a bit. I trust Brubaker, so I will wait and see. But as of the end of this issue I am thinking "If these people are playing around with the likes of DD and The Kingpin...what the heck is THAT GUY gonna do?" I just don't know what he could possibly bring to the table. On, the other hand, look at the position that that has put me in as a reader. Here I am underestimating a wild-card antagonist. Could be that is exactly the position I, and the other characters, SHOULD be in. There are a few pages, most notably the confrontation between Matt and Foggy, where the art style does not work as well as it usually does. I do not know exactly the working relationship between Michael Lark and the new artists which are listed with him, nor do I know who did what on which pages. But, bringing in a bigger art team usually means a struggle to meet a deadline or maintain a schedule. The transitions are fairly seamless, but this particularly emotional scene is stricken a bit flat when seen side-by-side with the work of Lark, who has been with these characters for this entire run.